Business Terms &amp; Conditionas - Crown (RDR) Automotive Sales International s.r.o. The only way to appreciate Crown replacement parts and accesories is to live it through our high quality. And the only way to get our newest stuff is in our our stores or shopping thru our website.For over 45 years we’ve dedicated ourselves to producing the highest quality. However, as we continue to produce the best, counterfeiters are making cheap knockoffs that are often mistaken for the real deal. 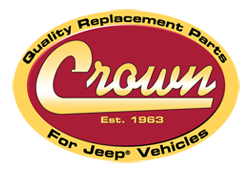 So make sure you get all your Crown from one of our stores, company website or catalogs.If you think you have counterfeit Crown, or if you see our replacement parts somehow looks as not ours, let us know. From anywhere, you can email us. Just drop us a note at dmrdr@crownautomotive.cz . We appreciate your help. Purchaser information – name and surname, company name and registered office, place of business or place of residence; purchaser's business identification number and VAT if registered as a VAT payer and involved in business-related activities; purchaser's telephone number and e-mail address. Upon a common Purchase Order by the Purchaser, the Vendor shall verify this order and confirm the Purchase Order to the Purchaser; the confirmation shall include the type, number and anticipated price of the products, which the Vendor is obligated to deliver to the Purchaser, as well as the deadline for delivery of the goods ordered. Once the Purchase Order has been verified by the Vendor, it shall be considered binding for both Parties. This provision shall not be binding for the Vendor in the case that the manufacturer no longer supplies a specific product and/or introduces new product versions to the market. The standard method of payment in the amount of the purchase price of the goods delivered is by wire transfer following an advance invoice or a final invoice. if required, payment verified to the Vendor's bank account by the agreed means (in the case of advance payments). The goods ordered shall be dispatched within the next four days following the day on which the above conditions for the delivery of goods have been fulfilled. The goods are delivered under the same conditions as in the case of "Collection on Delivery" except that the Purchaser has agreed with the Vendor on individual means of payment. The Purchaser is obliged to accept the goods ordered from a third party (logistics partner of the Vendor) who will deliver the goods via a forwarding agent. The Vendor as the debtor agrees on this method of meeting his/her obligation to deliver the goods ordered. The Purchaser is obliged to collect the goods at the Vendor's place of business. The Vendor shall notify the Purchaser that the goods are ready for collection via telephone or e-mail message specified in the Purchase Order within five business days following the day on which the above conditions for the delivery of goods have been fulfilled. The place of fulfilment in the case of collection of goods under points 3.1, 3.2, and 3.3 shall be the Vendor's storage facility. The Vendor's obligation to deliver the goods ordered shall be considered fulfilled once the goods have been collected by the Purchaser at the agreed Place of Fulfilment or once the goods have been handed over to the forwarding agent for transport to the destination. From this moment, the Purchaser shall be responsible for any possible losses related to the goods (damage to the goods, loss, theft etc.). The goods’ price does not include individual forwarding charges, which shall be added to the goods’ purchase price based on the weight and size of the parcel. The Parties to this Contract have agreed that if the goods ordered by the Purchaser and dispatched by the Vendor are not collected by the Purchaser either from the forwarding agent or personally at the Vendor's place of business, the Vendor shall be entitled to require the Purchaser to pay a contractual fine (Purchase Order Cancellation Fee) amounting to $ 200, unless otherwise agreed on by the Parties. If the goods (i.e. the deliverables) are sold based on a purchase order made by the consumer using means of remote communication (primarily e-shops on the Internet), the purchaser – consumer is entitled to withdraw from the contract within fourteen days following the day on which the delivery has been completed. This period shall be extended to three months provided the vendor has not provided the consumer with the information as required under § 53, Sections 4 and 5 of the Civil Code of the Czech Republic. If the information as required under § 53, Sections 4 and 5 of the Civil Code of the Czech Republic, is provided to the consumer at any moment within this three-month period, such period shall be considered expired and the fourteen-day period shall begin at that moment. other contracts listed in applicable laws. The consumer's notice of withdrawal from the contract concluded by means of remote communication has to be delivered to the supplier (vendor) within the withdrawal deadline. If the consumer uses his/her right to withdraw from the contract, he/she is obliged to return the goods completely and duly, i.e. in the original state and packaging, fit for further sale, intact and including all documentation handed over to the consumer. The consumer shall return the goods to the vendor's address. The withdrawal from the contract implies the obligation of all parties to return to each other everything that had previously exchanged hands. Direct expenses on returning the goods shall be the responsibility of the consumer. Following the consumer's withdrawal from the contract and the due return of goods, the vendor is obliged to return, without undue delay, the entire amount paid for the goods to the consumer. However, the vendor is entitled to deduct the amount paid by the vendor for the transport of goods. Any contract concluded by means of remote communication can be withdrawn from by the consumer only under the conditions provided in the Civil Code of the Czech Republic (§ 49, § 517 Section 1, § 597, § 623, and § 679). The term "consumer" in the above provisions refers to the client – purchaser who does not act within his/her business or other commercial activities at the conclusion of the contract. If the Purchaser is an individual, he/she enters the following personal details into his/her Purchase Order: name and surname, full postal address, e-mail address, and telephone number. This information is necessary for the identification of the Purchaser and for any further communication. If the Purchaser is a corporate body, the following information has to be entered in addition to the information above: company name, identification number, and VAT. If the Purchaser is a natural person, his/her identification number, VAT and information on the place of business have to be entered in addition to the information above. This information allows the carrying out of all the necessary accounting operations, the issuing of the invoice usually required by both Parties, as well as to identify the payment made by the Purchaser by means of wire transfer. The Vendor is obliged to protect the Purchaser's personal data against any further disclosure and/or abuse. The above information is collected to increase the quality of the Vendor's services and the Vendor is by no means entitled to provide this information to any third parties without the Purchaser's prior consent. By using the e-shop, the Purchaser agrees with the collection of personal data and data from his/her Purchase Orders according to the provisions above. The Purchaser understands and agrees that in addition to the Business Terms and Conditions available on the Vendor's website or at the Vendor's office, the rights and obligations between the Vendor and the Purchaser, as well as the complaint procedure are regulated by the Vendor's Complaint Terms and Conditions which is also available on the Vendor's website or at the Vendor's office. The Purchaser declares that he/she has read, understood and agreed with these Business Terms and Conditions, Purchaser's Business Terms and Conditions, and the Purchaser's Complaint Terms and Conditions prior to filling in and submitting the Purchase Order. By filling in and submitting the electronic Purchase Order (or any other order form using the means of electronic communication, such as facsimile) the Purchaser also declares that he/she has been provided over his/her Internet browser the following information: information under the provisions of § 53, Section 4 of the Civil Code of the Czech Republic, i.e. Vendor's identification data (company name, identification number, registered office or address of residence in case of a natural person), the name and basic characteristics of the goods ordered, goods’ price, delivery expenses, methods of payment and shipment, information on the right to withdraw from the contract under § 53, Section 6 of the Civil Code of the Czech Republic, expenses on the use of means of remote communication, and the period of validity of any of the Vendor's offers and/or prices.